As the title of the novel Spirit of the Turtle suggests, the Unkechaug are the People of the Turtle. The animal plays a central role in important Unkechaug legends, and Solomon is well aware of the power of his people’s totem. The Unkechaug Nation has its home on the Poospatuck Reservation in the town of Brookhaven on eastern Long Island. Its population today is approximately 450, with just over half of its members residing on the reservation. One of the oldest in the United States, the Poospatuck reservation was established through a land agreement in the 17th century. Over time, the size of the reservation was reduced from approximately 175 acres to 55, without the consent of tribal leaders or approval of the New York State legislature. The Unkechaug people are descendents of the original inhabitants of Long Island. Their language is a part of the Algonquian linguistic family. Like other Indians of coastal Long Island, the Unkechaug have always been closely attuned to their maritime environment. Their traditional religious beliefs and material culture reflect this association. In the pre-contact period, they hunted seals, whales, and other sea mammals, fished in the coastal waters, and harvested shellfish. They celebrated the spirits of the deep waters by sacrificing to them the crucial body parts of the most powerful and awesome denizen of their maritime world. When the English, whose lifeways centered on agriculture, arrived on Long Island in the early 17th century, they turned to the native peoples as they adapted to an ecosystem that was alien to them. For the English, however, the whales were a commodity to be exploited not a being in a sacred environment. Beginning in 1650, the Unkechaug were hired by the English to hunt the North Atlantic Right Whales that migrated past Long Island from November through April each year. The Indians were provided with cedar whaleboats and harping irons to pursue a dangerous quarry in freezing waters. More intensive hunting efforts brought about a quick depletion of the local whale population, ending the era of shore whaling on Long Island. 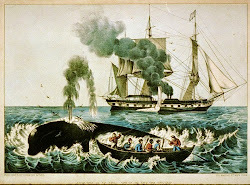 In the 18th and 19th centuries, Unkechaugs continued their maritime tradition, signing up with whaling crews on the large ships that hunted whales on long distance voyages. Like Solomon in the novel Spirit of the Turtle, they traveled around the globe on hunting expeditions that often lasted two or three years. Nowadays the Unkechaug are a vibrant community that has adapted to the changing world while maintaining their culture and traditions. A striking example is the June Meeting, which Solomon and his family participate in at the beginning of the novel Spirit of the Turtle. During the colonial period many of the larger tribal gatherings were prohibited by the whites who feared that plots against them might be hatched when large groups of native people assembled. As a result the Indians became much more secretive about their religious ceremonies. They began a tradition whereby these seasonal rituals were honored on a smaller scale as family reunions. The June Meeting today is a time for Unkechaug families to reunite for a weekend on their reservation and to observe formal services in church and informal meetings and meals in their homes. Another example of cultural preservation is wampum production. Wampum, or shell beads, served many functions in Native American societies in the form of decorative jewelry, devotional objects, and currency. In Spirit of the Turtle, Solomon’s grandmother prizes her wampum belt, which had belonged to her elders. The Unkechaug of today have adapted modern technology to craft their fine beadwork. Noted for its exceptional quality, Unkechaug wampum is in high demand by other Indian communities and collectors. Click here for archival photos of members of the Unkechaug Nation, past and present. Stone Levine, Gaynell and Nancy Bonvillain. Languages and Lore of the Long Island Indians. Suffolk County Archaeological Society. Lexington Mass: Ginn, 1980. Strong, John A. The Montaukett Indians of Eastern Long Island. Syracuse: Syracuse University Press, 2001. Strong, John A. “We Are Still Here!” The Algonquian Peoples of Long Island Today. Interlaken, New York: Empire State Books, 1998. "My blood melted and began to stir, my skin thawed with a slow burn, my fingers and toes grew soft and elastic. The ice broke into bits. In the water I saw turtles – turtles that cared not about latitudes; turtles that knew the world of spirits and the world of men could overlap at any time, in any place; turtles that knew everyone was important, even me. They had arrived, just in time, bringing the warm air. We wish our people to survive."